Sony's gone and made both the NEX-3 and NEX-5 official, with the NEX-5 carrying the large boast of being the world's smallest and lightest camera with interchangeable lenses. The leaked specs of the NEX-3 have panned out according to Sony's news release, but it's the NEX-5 I'm most interested in. 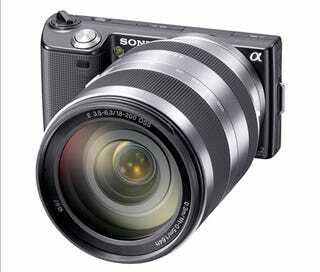 Both have 14.2MPs, Exmor APS HD SMOS sensors, an ISO range of 200 - 12800 and are compatible with all E-mount lenses. Video is where they differ however. The NEX-5 (above) can shoot 1080i, but the NEX-3 stops at 720p. Both have HDMI outputs and USB 2.0 for connecting to PCs, and they thankfully take SD, SDHC, SDXC cards as well as Memory Stick Pro Duo and Pro-HG Duo. Professional quality images are now available to all. Enjoy the stunning picture quality and shooting responses prized by DSLR users in two exceptionally compact new cameras that are brilliantly easy to use. Joining the Alpha family, the NEX-5 and NEX-3 team DSLR-quality imaging with the convenience of interchangeable lenses in a sleek new design, that slips easily into a bag or pocket. In contrast with conventional DSLR models, the ‘mirrorless' construction shrinks the thickness of the cameras to just 24.2mm (NEX-5 excluding grip and mount) and 25.4mm (NEX-3, excluding grip and mount) at their slimmest points. As a luxurious extra refinement, the NEX-5 features a tough yet light-weight magnesium body, making it the world's smallest and lightest interchangeable lens digital camera1. At the heart of both cameras is a newly-developed Exmor™ APS HD CMOS sensor with a resolution of 14.2 effective megapixels. Far larger than the sensor inside conventional compact cameras, its key to the extremely low image noise and creative defocus effects that consumers have come to expect from DSLR cameras. Still and video image quality is further refined by the powerful BIONZ processor that ensures speedy DSLR-style shooting reflexes with quick, precise autofocus and minimal shutter lag. Both cameras can also capture fast-moving action with a high-speed burst of full-resolution images at up to 7fps (AF/AE fixed from first frame). An elegant, uncluttered user interface – featuring a new ‘never get lost' menu – makes the powerful creative possibilities of the NEX-5 and NEX-3 accessible to photo enthusiasts and snap shooters alike. Shooting parameters are easily accessed via an intuitive control wheel and two soft keys. Turning the control dial, for example, allows depth of focus changes to be previewed ‘live' on the LCD3, giving effortless control over beautiful, pro-style portraits. Further help for photographers developing their skills is provided by a library of on-screen shooting tips and a friendly help guide. Images and camera settings are displayed on the large, bright 3" Xtra Fine LCD screen with TruBlack technology that tilts up or down for comfortable viewing in any shooting position. The screen features an auto-brightness function for excellent visibility, even when you're outdoors. TruBlack screen technology enables an even more vivid, high-contrast view of images and camera settings. Compatibility with a wide range of interchangeable lenses dramatically expands the artistic possibilities of the E-mount camera system. Ideal for everyday shooting, the low-profile E 16mm F/2.8 ‘pancake' lens (SEL16F28) minimises bulk when the camera is being carried in a coat pocket. Its field of view can be boosted even further by the VCL-ECU1 Ultra Wide Converter and VCL-ECF1 Fisheye Converter that deliver high-definition optical performance in a sleek, co-ordinated design. Featuring in-lens Optical SteadyShot image stabilisation for clearer handheld images, the E 18-55mm F/3.5-5.6 zoom (SEL1855) is perfect for every day shooting. The NEX-5 and NEX-3 are available in kit form with either lens, or as a double-lens kit that provides even greater shooting versatility. The E 18-200 F/3.5-6.3 zoom (SEL18200) lens is also available and offers a powerful 11x magnification range. It also features Optical SteadyShot image stabilisation in the lens and Active Mode ensures steady movie capture even when on the move. An optional LA-EA1 mount adaptor extends compatibility to the α family of 30 lenses, plus a huge range of other legacy A-mount lenses (Manual Focus only). The NEX-5 and NEX-3 are also the first α cameras to offer the extra convenience of HD video recording. At the touch of a dedicated Movie REC button, both NEX-5 and NEX-3 shoots Full HD (1920 x1080) video as high-quality AVCHD files that can be enjoyed by connecting to an HD television. HD video (720p) can also be captured by NEX-3 as compact MPEG4 files that are ideal for PC storage and web sharing. As an option, the smart accessory terminal on both cameras accepts the compact ECM-SST1 Stereo Microphone (optional) that captures a high-quality soundtrack for your HD videos. As previously introduced on the DSLR-A550, Auto HDR has been further refined. The NEX-5 and NEX-3 can now shoot a high-speed burst of three images at different exposure values that are combined in the camera. This produces a single High Dynamic Range image with extended highlights, more mid tones and shadow detail. Both cameras come supplied with a super-compact clip-on flash that attaches via the smart accessory terminal when needed for low-light shooting. Other optional accessories include the FDA-SV1 Optical Viewfinder plus colour coordinated cases and shoulder straps. The NEX-5 and NEX-3 cameras from Sony will be available in the UK from June 2010.